People with lucky Number 3 is one that emphasizes expression, sociability, and creativity as the lesson to be learned in this life. Here we are apt to find the entertainers of the world, bright, effervescent, sparkling people with very optimistic attitudes. A truly gifted 3 possesses the most exceptional creative skills, normally in the verbal realm, writing, speaking, acting, or similar endeavors. The lesson to be learned with a 3 lucky Number is that of achievement through expression. The bright side of this path stresses harmony, beauty and pleasures; of sharing their creative talents with the world. 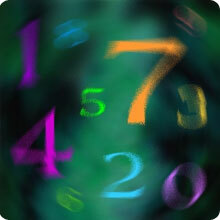 Capturing their capability in creative self-expression is the highest level of attainment for this lucky Number. The characteristics of the 3 are warmth and friendliness, a good conversationalist, social and open. A good conversationalist both from the standpoint of being a delight to listen to, but even more importantly, one who has the ability to listen to others. Accordingly, the lucky Number 3 produces individuals who are always a welcome addition to any social situation and know how to make others feel at home. The creative imagination is present, if sometimes latent, as the 3 may not be moved to develop his talent. The approach to life tends to be exceedingly positive, however, and their disposition is almost surely sunny and open-hearted. They effectively cope with all of the many setbacks that occur in life and readily bounce back for more. It is usually easy for them to deal with problems because they can freely admit the existence of problems without letting them get they down. They have good manners and seem to be very conscious of other people's emotions and feelings. Life is generally lived to the fullest, often without much worry about tomorrow. they are not very good at handling money because of a general lack of concern about it. They spend it when they have it and don't when they don't. On the negative side, a 3 may be so delighted with the joy of living that the life becomes frivolous and superficial. they may scatter their abilities and express little sense of purpose. The 3 can be an enigma, for no apparent reason they may become moody and tend to retreat. Escapist tendencies are not uncommon with the 3 lucky Number, and they find it very hard to settle into one place or one position. Guard against being critical of others, impatient, intolerant, or overly optimistic. Typically, the lucky Number 3 gives an above-average ability in some art form. This can encompass painting, interior decorating, landscaping, crafts, writing, music, or the stage, or all of the above. they are apt to be a happy, inspired person, constantly seeking the stimuli of similar people. Their exuberant nature can take they far, especially if they are ever able to focus their energies and talents.